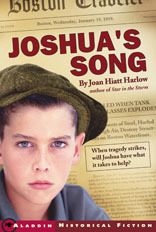 JOSHUA'S SONG has been featured as part of the regular curriculum in Massachusetts schools. Once again it is a popular school and library reading project -- this time for the city of Woburn, Massachusetts. See Web site here. JOSHUA’S SONG has been nominated in the top ten for the State of Connecticut Nutmeg Awards. SELECTED BY THE CHILDREN'S BOOK COMMITTEE AT BANK STREET COLLEGE OF EDUCATION IN THEIR 2002 EDITION: "THE BEST CHILDREN'S BOOKS OF THE YEAR"! Criteria: Literary quality and excellence of presentation as well as the potential emotional impact of the book on young readers; credibility of characterization and plot, authenticity of time and place, age suitability, positive treatment of ethnic and religious differences, and the absence of stereotypes. Boston, 1919. It's been a year of distressing changes for thirteen-year-old Joshua Harper. The influenza pandemic that's sweeping the world has claimed the life of his father; his voice has changed so he can't sing in the Boston Boy's Choir anymore; and now money is tight and his mother is asking him to quit school to get a job. It's not fair! Joshua begins working as a newspaper boy, hawking papers on the street. He soon finds himself in rivalry with Charlestown Charlie, a tough street-wise Irish boy. Now Joshua is completely torn between the privileged life he once knew as one of the well-to-do Beacon Hill Boys, and his new existence on the street, among tenements and street vendors. How Joshua adjusts and comes to find his voice, his song, and his place in the world by his acts of courage during a terrifying crisis is the heart of this fast-paced, suspenseful novel. Joan Hiatt Harlow has created a memorable character in Joshua and a remarkable story based upon true incidents in Boston history. ... A fast-paced, touching story covering many realms of life in 1919, especially children of poverty, this well-told story brings history to life. Boys will be particularly interested in the life of newsboys. Gr. 5-8. Even readers who don't usually like historical fiction will enjoy Harlow's vivid depiction of early-twentieth-century working-class life and conditions. They will also like the fast-paced story, which revolves around an actual incident, the Great Molasses Flood of 1919. Gr 4-6-A fast-paced novel with a likable main character. Harlow skillfully integrates historical fact to make a colorful setting believable. An after word gives other interesting details. A worthwhile title for historical-fiction collections. Elementary school kids school project about the molasses flood.